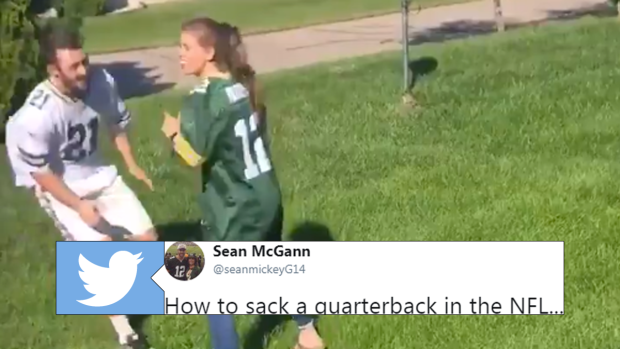 Green Bay Packers fans are feeling like they’re getting hosed, because two weeks in a row they have been on the wrong end of a baffling roughing the passer call. Nobody is confused by the NFL’s goals with their new rules, of course they want to protect the players playing the most important position in their game and all of the news constantly dissecting the danger of their game can’t help. Now fans are starting to mock the new rules, because nobody seems to know what a clean hit is anymore. In case you missed the reason for all this mockery, the latest one is this sack from Clay Matthews. Apparently he received the flag because he landed with all of his weight on the Jimmy G.
Clay Matthews was flagged for roughing the passer on this play. Clay Matthews is not a fan of these new rules.